Baking and Cooking, A Tale of Two Loves: Blueberry Lime Ice Cream, A Healthier version? 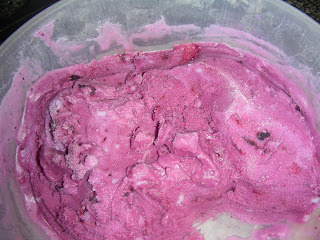 Blueberry Lime Ice Cream, A Healthier version? 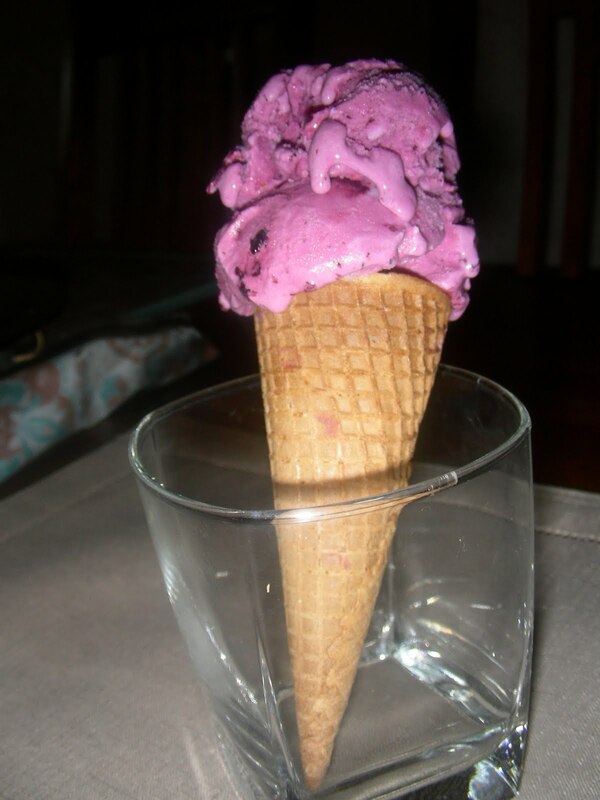 Which picture is the the healthier version of Foodalution's Blueberry Lime Ice Cream? If you said the picture on the top, you would be right. However, the healthier version didn't taste like the original version. After we made the Vanilla Vanilla Ice Cream, I posted that maybe the next batch of ice cream that we make, might be healthier. So we used modified Foodalution's recipe, substituting 2 pints of half and half with 2 pints of whole milk, and one pint of whipping cream for 1 pint of half and half.. The recipe made more ice cream than our machine would hold, so we only did half of the healthier version. What we got was more like sherbet or ice milk, definitely not the same consistency. So, then I went to the store and bought heavy whipping cream and half and half to make the original recipe with the remaining blueberry mixture The original version is on the bottom,. so yummy and creamy. So what do we do with the healthier version of the Blueberry Lime ice milk? Stay tuned and read my next post. A hint, something about cookies! That looks so yummy Becky! You should make Blueberry gelato it's lower in fat and tastier! Have to admit that the original version looks tremendous. I love blueberry and lime. They sound fantastic together. Hi Becky! I never knew you made this.... yummmm!!! Glad you enjoyed!